As we move into double figures for our mixtape series, we invite Glasgow based producer Koreless to join the growing list of talent. Taking a “this is what I’m listening to at the moment” approach, he has delivered a smooth 40 minutes of Jazz for your listening pleasure. We always say to DJ’s that they are welcome to mix whatever they want, however they want, ensuring that they have complete creative control over the mixtape and all-in-all making for a more forward thinking and varied series. 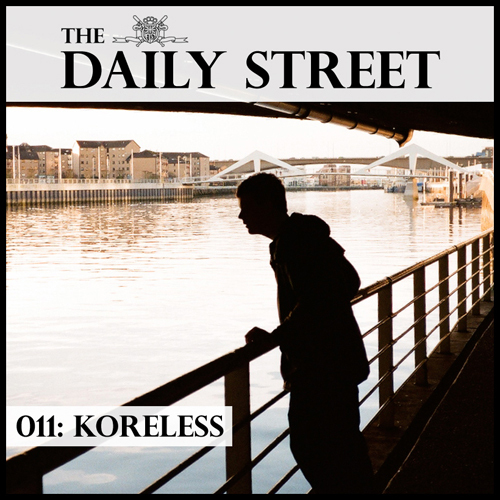 Mixtape 011 is a great example of one of the unpredictable outcomes that this approach can have, with Koreless going on a Jazz vibe that makes for one of the greatest 40+ minutes of music listening to be posted on The Daily Street. For those that don’t know of Koreless, let me first say, you will do by the end of 2011, that’s for sure! A truly original producer, Lewis (Koreless) is crafting his own niche through his unique sound of melodic Bass Music, having his debut release on Pictures Music, a very successful remix of Jacques Greene, a collab with Sampha in the pipelines (which is amazing by the way) and a forthcoming remix of Ghost Poet – it’s fair to say that Lewis is causing some commotion in the scene. With his debut London booking being at Young Turks, the likes of Gilles Peterson predicting him to be the next James Blake or Ramadanman and a show at this years Outlook festival, it just seems like destiny that Koreless is going to be a household name in no time at all. I suggest you sit back, make a cup of tea and take the next 40 minutes easy whilst listening to this fantastic mixture of music. What approach have you taken for this mix? Which track or mix is your personal favourite? Is style important to you? What brand(s) are you particularly feeling at the moment?